The Oral tradition is that the Arab world had trade contacts with Kerala coast from very early times. Interaction with the Arabs brought Cheraman Perumal(the last Chera king to rule Cheranad (ancient Kerala)) closer to Islam. Later the king partitioned his kingdom among several chieftains for smooth governance, went to Mecca and converted to Islam and accepted the name Thajuddin. He married the sister of King of Jeddah and settled down there. As the tradition goes, Cheramanperumal, when he was convinced of his imminent death, wrote letters to his relatives in Kerala seeking their help to propagate the tenets of Islam in Kerala. After his death, when Malik Bin Dinar (a disciple of Prophet Mohammed and a contemporary of Cheraman Perumal) came to Kerala, he brought the letters written by Perumal. The rulers of Kerala honoured the letter and permitted Malik Bin Dinar and his fellow Arab Muslim traders to establish mosques at different places in Kerala. 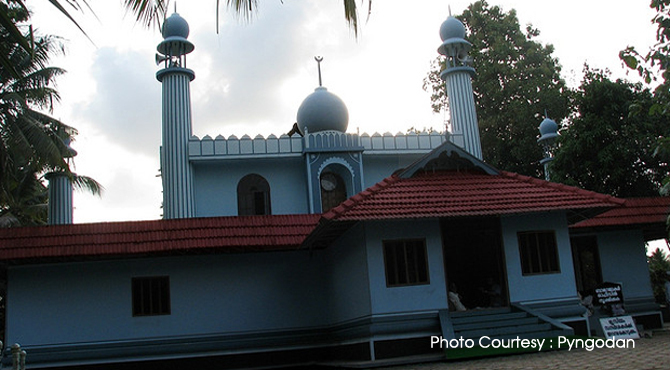 This mosque at Kodungallur was the first to be established and Malik Bin Dinar himself became the first Ghazi of the mosque. Later Malik Bin Dinar appointed his son Habib Bin Malik as the next Ghazi, travelled all around Kerala establishing mosques in different parts of the state. Kerala Vyasan Kunjukuttan Thampuran is of the opinion that an old Buddha temple was handed over to the Muslims to establish a mosque there. It is believed that the mosque was first renovated or reconstructed sometime in the 11th century AD and again 300 years ago. The last renovation was done in 1974 as a result of increase in the population of the believers an extension was constructed demolishing the front part of the mosque. 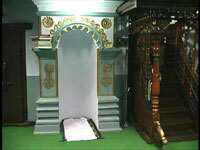 The older part of the mosque including the sanctum sanctorum was left untouched and is still preserved. Extensions were again made in 1994 and 2001. The wooden interior of the ancient mosque remains intact but the exterior was changed completely. The facade now has concrete minarets. Built in the Indo-Saracenic style of architecture, the Cheraman mosque has finely crafted woodwork especially in the pulpit, and uses a traditional Kerala brass oil lamp, mostly found in Hindu temples. There is an ancient ceremonial pond near the mosque which is still intact. It is believed that the old two tombs, seen here belongs to Habib Bin Malik, son of Malik Bin Dinar, and his wife Khumarriah. A block of white marble in the mosque is believed to have been brought from Mecca. Devotees in large numbers visit the mosque especially during Ramzan, and they include pilgrims from different communities. Perhaps this is the only mosque where 'Vidyarambham' is performed on the Vijaya Dasami day and many non- Muslim devotees initiate their children into the world of literacy at the mosque. Women are not allowed into the mosque at any time. The mosque is managed by a Mahallu Committee elected as per the by laws, consisting of only adult members for a period of two years. There are many historical places in the vicinity of the mosque. The old palace of the Chera kings and a Mahadeva temple is just 250 metres away from the mosque. The famous Kodungallur Bhagavathy temple is 2km away and the site where St. Thomas landed in 52 AD is around 5 km away from the mosque.